I have taken the script from the video and transcribed it in first person. If one question helps, it makes a difference. “Well. I just finished up my drone test. I am filming in the car. So, the big deal is my surprise. I’ve taken a lot of FAA tests before. I am a pilot and a licensed mechanic. This FAA test did not follow the study guide like I thought it would. I was surprised there were several questions that were not in the FAA study guide. It is going to take me a day or at least a night to sort the test out. In the morning, we will talk about the bottom line of the test. “Alright! It is the day after the test and it is time to have an adult conversation about the Part 107 UAS written test. 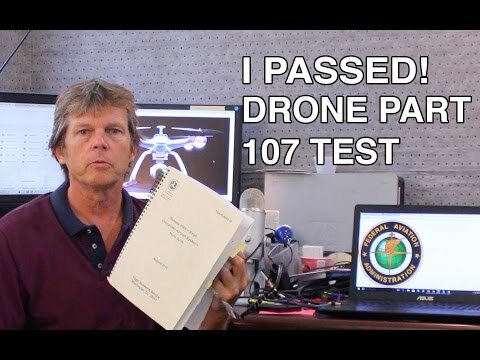 A friend of mine told me that he had a friend who flew UAV’s for a long time and he got a 95% on the test. “I told him I thought it wasn’t true. He said his friend had been flying for a long time and I told him it didn’t matter. Here is why… just flying UAV’s doesn’t cut it. They asked this question, “If your company was going to establish a safety management system, what steps would you want to go through?” Safety management systems are something that scheduled airlines have. That was not in the Part 107 Test Guide. “A) The temperature of the collecting surface is at or below freezing when small droplets of moisture fall on the surface. “B) The temperature of the collecting surface is at or below dew point of the adjacent air and the dew point is below freezing. “C) The temperature of the surrounding air is at or below freezing when small droplets of moisture fall on the collecting surface. “That was not in this book. I am on page 25 of the FAA’s Remote Pilot Study Guide and it is not in the book. The reason I found this is they use the question for the commercial pilot written test. That is why it is out there and how I found the database question. “So, what I am saying is there is a lot stuff not in the study guide. Now to get the right answer you have to go to the Pilots Handbook of Aeronautical Knowledge. This is the handbook they use for private pilots. The other thing that I want to talk about is the human factor. The problem is the “I Am Safe” checklist. You have to memorize what each one of these letters represents. They asked me what the “M” stands for. I don’t think you have to memorize it to fly a UAV in Afghanistan. I’ve taken several FAA tests. I am a private pilot. I’ve taken the FAA private pilot written test, instrument written test, air frame test, FAA general test and the FAA power-plant test. “So I’ve taken a few tests and this is typical FAA bureaucracy. They really have a hard test and they also put things that are in the information that is on the test. This means you to have to study the test questions and frankly you are going to have to memorize some of this stuff if you want to get through this test with a Pass. There are plenty of blog posts and plenty of people who’ve gone out and failed this test. There are also people who’ve passed. There are people who say they’ve got a 100% and I find that very hard to believe based on the fact that there’s questions on this test from the commercial pilot exam. Learn More About ConnexiCore Cloud Flight Services.